Meet Jasper. 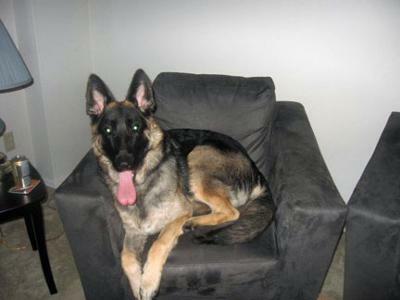 Five years ago, I saw a posting on Kijiji for a free German Shepherd 3 month old puppy. I wondered why would a beautiful pure bred German Shepherd be free? Being on a low budget, and desperately wanting a pure bred, I quickly called the number on the ad and inquired about him. When I asked why he was free, the breeder told me he was a special needs dog with a condition called ‘Megaesophagus ’. She said she wasn’t looking for any money for him, just a good home where he would be well taken care of. When I asked what that entailed, she told me that he had to be fed a proper way and could not have any solid food. Even though I didn’t have much money, I knew that I would be willing to do all that, as I am on a disability pension and am home all day. I told her I’d like to meet him and we arranged for a time to do that. As soon as I saw his little face, I knew right away that I was destined to have him. I told the breeder I wanted him and took him home that day. That was the best decision I ever made. Jasper is now almost five years old and truly is my best friend. We share everything, including the couch, the bed (which he likes to hog the covers!) and most importantly.. our love. He is healthy and happy and his favourite past times include hiding my socks, playing fetch with all his squeaky toys and scaring the mail man. My heart has tripled in size since I got him and I can’t imagine not having him in my life. It’s almost ironic that in the beginning, I went in, saving him while in the end, he ended up being the one who saved me. And to the vet who said to put him down because he wouldn’t live past a year old, I dare you to look Jasper in the face today and say that. I double dog dare you! What a handsome GSD! Love those big German Shepherd ears. He looks healthy and happy. Take care of your boy and he will take care of you!